Looking For BPA Free Freezer Bags? Health-conscious customers are increasingly turning to BPA free freezer bags. This is because scientific studies have found that the chemical Bisphenol A (often referred to using its abbreviated form, BPA), which is used in the manufacture of many food-grade plastic containers, causes many adverse health effects, including cancer. So, if you want to ensure that this harmful chemical does not sneak into your food, it might be a good idea to check out the following freezer bag brands. All FoodSaver freezer bags are BPA free. But that's not their only advantage. FoodSaver offers a convenient range of versatile storage options. First, they come in bags or rolls. In addition, FoodSaver caters for several specialties: expandable, freeze ‘n steam, heavy duty, leak proof or portion pouches. You can read more about how to select the one that best matches your needs here. The bags come in 3 sizes: pint, quart or gallon. That way, you don’t have to force neck bone cuts into a pint-size bag. The FoodSaver freezer rolls have lengths of 8”, 11” or 15”. The longer ones are especially designed for, well, long items. So don’t freeze your beef chucks short! You can read more about FoodSaver Freezer bags and rolls here. Glad freezer bags’ yellow, red and blue packaging is one of the most recognizable food storage branding in America. All Glad freezer bags are BPA free, which means that what you freeze is what you eat. So you can be sure that this harmful chemical won’t be lurking in your food when it’s time to eat it. And these Glad BPA free freezer bags are one such shield. These Glad bags come in 2 sizes—quart and gallon. The single layer zipper freezer bags and the 2-in-1 zipper bags. While each zipper bag is made with a single layer of thick food grade plastic, each of the 2-in-1 zipper bags has 2 layers, which makes them leak proof. So you can freeze your broths and juicy steaks in them! Green N Pack freezer bags are packed with a surprising range of benefits. From a health standpoint, they are made from the FDA-approved, high-quality polyethylene #4. This material isn’t just BPA free, it also doesn’t contain the equally harmful chemicals PVC or phthalates. From an environment standpoint, they are eco-friendly and they decompose just as easily as leaves! How fantastic is that for those of us who are keen to reduce our carbon footprint! They are safe for storing food as they are free from the harmful chemicals named and shamed above. They are available in quart and gallon sizes, giving you the freedom of using a bag that is just right for the food you need to freeze. Because the plastic used is thick, these bags do a pretty good job of protecting food from freezer burn. The bags are reusable, saving you the money you’d have spent on more single-use bags. They are ideal for freezing everything from fruit, veggies, cookies and pastries, meat, fish, poultry and even cooked food. So they are a good choice for batch cooks, too. The Green N Pack bags are safe for use in the microwave. Before reheating & defrosting, just remember to open the bag zipper about 1-2 inches before placing it in the microwave. This will allow the steam to escape, instead of building up in the bag, which could cause it to explode and create a mess. The bags have a large write-on area that makes it easy to indicate the contents and their freezing dates. Is it any wonder that all Green N Pack BPA free freezer bags have legions of raving fans? 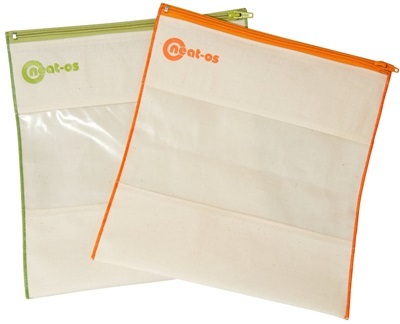 To say that the Neat-os freezer bag set is BPA free is to sell it short. It is, of course, BPA free but that’s not all. It’s virtually non-toxic, given that it’s also lead-free, PVC-free and phthalate-free. Each bag measures 11” x 11” providing gallon-sized freezer storage for herbs, lettuce, grains and many other items. It has beautiful orange and green trimmings and is designed with fine workmanship which makes it a welcome addition to your kitchen. It's versatile. So, it’s fit for the freezer, refrigerator, pantry, the farmer’s market and even your favorite picnic site. Great too for storing art and crafts, make-up, toiletries, receipts and suitcase packing. It's dishwasher safe so it’s easy to clean and will be ready for reuse in a jiffy. It has a convenient see-through window so you can easily identify its contents and even see how much spinach or kale is left inside! It’s made in the USA! So choosing this BPA free freezer bag set makes you a true patriot as you are supporting an American manufacturing company. Prefer BPA free freezer bags that use vacuum sealer systems instead? The Waring Pro bags have your back! Each set comes with a count of 24 quart freezer bags. That’s enough to cater for 2 dozen freezer storage sessions. They are safe to freeze, refrigerate, microwave and even boil as they are designed to withstand extreme cold, heat, plus steam. They are an excellent way for minimizing freezer burn as the small red valve on each bag allows for air removal with the Pistol Vac. That way, your food stays fresher for longer. The bags are reusable so this Waring Pro freezer bag set saves you money. But it also reduces the volume of trash that ends up at the already overflowing landfills. Just be sure to clean the bags thoroughly before reusing. This BPA free freezer bag set is designed for use with the Waring Pro PVS1000 Pistol Vac Professional Vacuum Sealer System which comes with an amazing 5 year warranty on the motor. Prefer BPA Free Freezer Containers Instead? Be sure to check out our page on BPA free freezer storage containers.